I don’t care what anyone else says; this has been an excellent summer for movies, one of the best in years. There’s something magical about looking forward to a new blockbuster every weekend, and there’s something even more magical in having almost all of them deliver in their high expectations. It’s a bit sad really that August 24th marks the end of the summer movie season, with the release of “Mr. 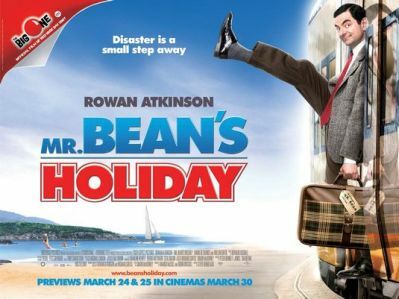 Bean’s Holiday”, the last 2007 summer sequel, and the last real “summer” movie of the year. But thankfully, “Mr. Bean’s Holiday” ends the summer on a great note. It’s a fun, engaging, laugh-a-minute romp that will leave you breathless from laughing and would brighten even the gloomiest of days. The very small supporting cast is very good too, supplementing Atkinson just as much as they need to. The stand out performance is Willem DaFoe as Carson Clay, and egotistical filmmaker whose movie is constantly being ruined by Bean. To add to the hilarity is a great soundtrack, featuring some fun rock songs and an excellent score that complements Bean’s antics very nicely. I should warn you, however, that if you’re only exposure to the character was the 1997 movie, you’ll be taken aback by this one. That movie did not stay true to the TV series, by having a large supporting cast and having Bean talk. While funny in its own way, it was not an accurate representation of the character. “Mr. Bean’s Holiday”, on the other hand, is much more like the TV series, with Bean being the center of attention and having very little dialogue, beyond grunts and such. Go in with the right expectations, and hopefully you’ll enjoy the movie as much as I did. While “Mr. Bean’s Holiday” probably won’t make it onto my top ten list, I must admit it was one of the most enjoyable movies of the summer, and an excellent movie to end the summer movie season with.